Shepherd Neame pub and small gig venue in Clerkenwell. 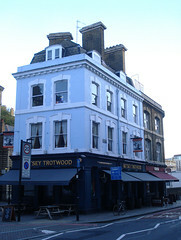 Named after the character from Dickens' David Copperfield, the Betsey Trotwood has been a venue for small bands and clubnights for many years. It has both an upstairs room and a 'cosy' basement venue available to be booked out, while the ground floor remains a perfectly decent environment for a pint. It was redecorated in 2012 and now has a rather smart green/dark wood colour scheme. On Kat's visit in March 2014, there were three handpulls on, all serving Shepherd Neame beers (I only tried the Early Bird, and it was well-kept). It was relatively quiet in the main section, considering it was a Saturday evening — the website advises booking a table for food on weekday lunchtimes, however. Accessibility: the ladies' toilets are down a flight of stairs, next to the basement venue (past the alarmingly life-sized picture of Alvin Stardust). Last visited by Kat and friends, March 2014. Last edited 2017-03-23 20:01:13 (version 4; diff). List all versions. Page last edited 2017-03-23 20:01:13 (version 4).